Usually, we relate RAM with the speed/computer performance which is right in broader sense. 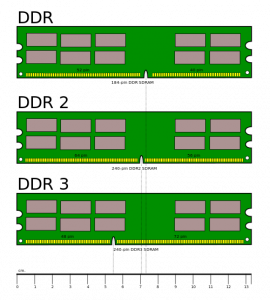 RAM (Random-access memory) does speed things up, word DDR stands for Double Data Rate, DDR technology superseded SDR – Single Data Rate RAM technology allowing data transfer at a double rate with same clock frequency. DDR2 Vs DDR3 can be realized by transferring the same file twice using different RAMS (DDR2, DDR3) each time. None of DDR2 and DDR3 RAM are forward or backward compatible with DDR1 motherboards. Imagine a .mkv file of 6400 MB and no other service/app/process is consuming the RAM and Whole RAM is available for data transfer. given a base clock speed of 100 MHz, entire file will be transferred in just 4 seconds, 2 seconds, 1 second with DDR, DDR2, DDR3 RAM respectively. 32-bit or 64-bit – for more than 4 GB systems you must have a 64-bit operating system. Frequency – motherboard will accept only certain frequency. Voltage – Some RAMs uses higher voltages which motherboard may not be able supply. QVL (Qualified Vendors List) – specified on manufacturer motherboard page which states which RAM was tested and is guaranteed to be compatible. Prefer 2 X 2GB over 4 X 1 GB RAM, as it will may have compatibility issues. No of slots available in your machine/computer/laptop.